The lengthy list of everyday, ordinary, humdrum things in this world - to which I am inexplicably attracted - would not be complete without the inclusion of silos. ...but I'd prefer to believe that it's entirely the result of accidentally discovering the panorama feature on my Cybershot...after which I found myself on a perpetual hunt for long and tall subjects to shoot (not to date). Obviously silos, which stand so statuesque and erect (*ehem*) fit tidily into the "tall" category. But it's not uncommon for the pastoral landscapes atop which they sit - to be well-suited for "long" pictures, while I'm at it. And unlike some subjects in the frame, even the humblest of silos don't need to try and hog all the attention (buh dum bum)...their contribution to each shot is consistently of equal or greater value than that of their competition. For example, I spent just as much time taking snaps of this lovely corrugated, metal structure - as I did snapping pics. of the pig. I feel fortunate in that - my immediate geographic surroundings, facilitate feeding my fascination not only with silos - but with farms as a whole, in general (just one more reason to be glad I left the city). Sometimes a silo doesn't flaunt its true beauty. There was little about the facade of this forgotten storehouse, that impressed me upon first sight. 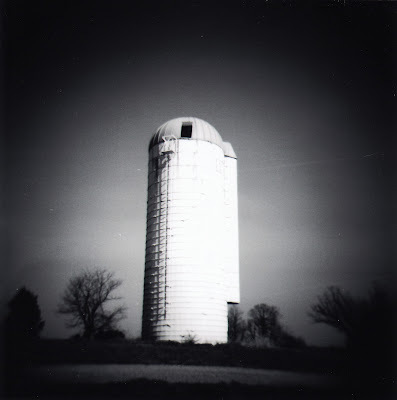 I've been to this farm many times now, and featured its silo in all sorts of pics. - including self-portraits which I wrote about in this older Big Ugly entry.